Our kanban style solution for task and project management in SharePoint has become popular, and now we also introduce it as an app - or add-in. Microsoft is going the change the term "app" into "add-in", to be consistent with supplements to other platforms, like Outlook add-ins. Kanban Task Manager builds on the traditional kanban board, where cards are moved as work on a project proceeds. There are two Outlook versions, for workgroups and single users, and now also two SharePoint versions. The kalmstrom.com virtual kanban boards take advantage of the platforms they build on, and they course have many more features than a physical board. Kanban Task Manager SharePoint Add-in has the same features as the Kanban Task Manager Sandboxed Solution, but there are some differences in use and implementation. I cannot say that one is better than the other, and as the kalmstrom.com Sandbox Solutions are NCSSs, which Microsoft will continue to support, I see a bright future for both versions. Add-ins don't run on the server at all. Instead all functionality runs in the browser, and that might give SharePoint admins an extra reassurance that the Add-in cannot harm their servers or reduce the performance of their SharePoint Online websites. One important difference between the Add-in and the Sandboxed Solution is compatibility. SharePoint 2010 does not support add-ins, so you must have at least SharePoint 2013 or Office 365 SharePoint Online to use Kanban Task Manager SharePoint Add-in. The Sandboxed Solution supports SharePoint 2010 too. Both versions support SharePoint 2016. 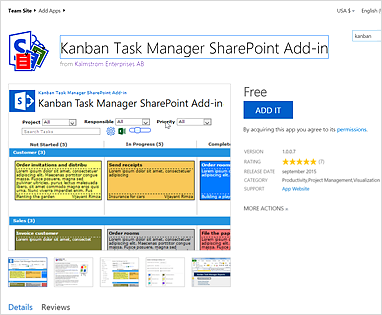 Kanban Task Manager SharePoint Add-in may be inserted as an App Part on any page in the site collection where the Add-in is installed and configured. This means that each user may have Kanban Task Manager on the page he or she prefers. The App Part looks more like the Sandboxed Solution than the Add-in, because it has the SharePoint navigation and the task form is a standard SharePoint list item where the Kanban Task Manager tagging dropdowns have been added. 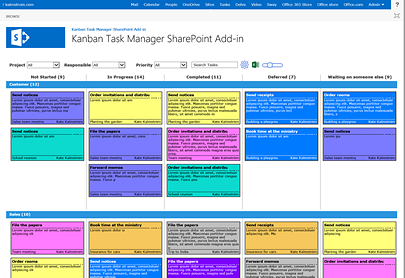 Kanban Task Manager SharePoint Add-in can be downloaded for trial from the kalmstrom.com website or directly installed from SharePoint Store. From SharePoint you can reach the SharePoint Store via Site Content >Add an app. Subscribers to Kanban Task Manager for SharePoint (the Sandboxed Solution) may switch to the Add-in without any extra costs if they so wish. Just contact the kalmstrom.com support and we will assist you. Finally I want to give credit to kalmstrom.com Lead Developer Jayant Rimza, who has been responsible for the development of Kanban Task Manager SharePoint Add-in. He encountered some complicated problems in the process, but as usual his creative mind found excellent solutions to them all!